The Canadian Dollar was supported the BOC but oil prices weighed. A light week leaves the loonie mostly at the mercy of oil and the global mood. 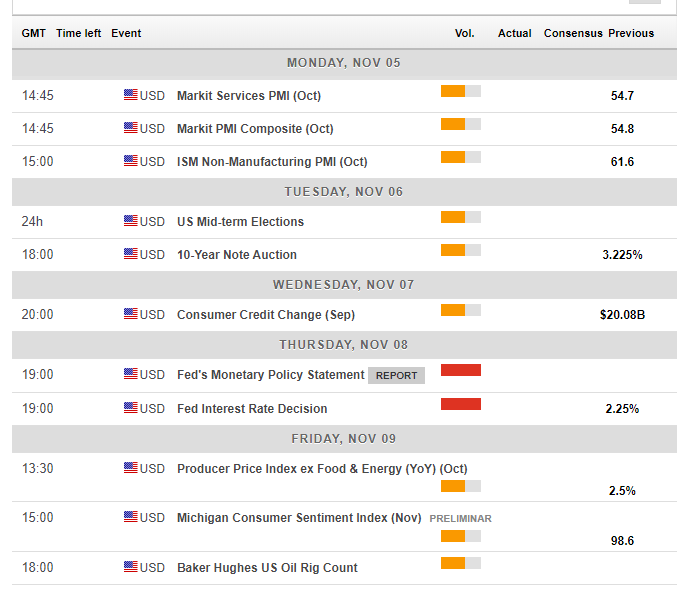 The technical picture is bullish while the FX Poll shows a neutral to bearish bias. Bank of Canada Governor Stephen Poloz and Deputy Carolyn Wilkins testified in parliament and expressed optimism about the economy. Wilkins went further and said it is the best time to raise rates. The economy grew by 0.1% in August, better than had been expected. In addition, job growth also surprised to the upside with 11,200 positions gained. On the other hand, Canada's central export, oil, fell sharply. Iranian oil will eventually reach global markets as the US is set to waiver the upcoming sanctions from eight countries. In addition, the supply/demand balance tilted against the price of the black gold. The downfall in crude, which is in a bear market, weighed heavily on the loonie. Data was mostly upbeat. The US gained 250,000 jobs in October, better than expected. In addition, wage growth finally surpassed 3% and hit 3.1%, the best since 2009. The primary driver for the US Dollar and markets was the relationship between China and the US. In a turnaround, President Trump tweeted about a successful conversation with his Chinese counterpart Xi Jinping. Reports later came out about preparations for a trade deal. Despite denials, the upbeat mood prevailed in markets and weighed on the safe-haven US Dollar. Building permits kick off the week. They rose by 0.4% in August. The Richard Ivey School of Business reported a dramatic downfall in its PMI back in September, but that was just before the new trade deal, the USMCA, was announced. A leap back to higher levels of growth is projected. Housing starts disappointed in September and may now bounce back up above the 200K annualized level. More importantly, the US imposes the sanctions on Iran at the wake of the new week. At the moment, the waiver for eight countries implies a smooth transition to the new regime. A lack of any supply shocks is due to weigh on petrol prices, with a consequent adverse impact on the Canadian Dollar. Canadian oil already trades at a substantial discount in comparison to US oil. The US ISM Non-Manufacturing PMI will provide an insight into the services sector and will likely slide after the manufacturing figure already dropped. The timing of the publication, after the NFP, diminishes its impact. The primary event of the week is the Mid-Term Elections. Americans will vote in a new House of Representatives and 36 Senators. Trump's Republicans are set to retain the Senate but lose the House to the Democrats. They may halt tax cuts, limit trade and also open investigations into the Presdient's dealings. The greenback enjoyed a rally in 2018 thanks in part to Trump's policies, and a divided government may reverse the trend. A surprise Republican victory in both chambers could keep the greenback bid. The Federal Reserve is predicted to leave the interest rate unchanged on Thursday. It is the last decision without a press conference. They are set to hike rates in December and will likely attempt not to rock the boat. 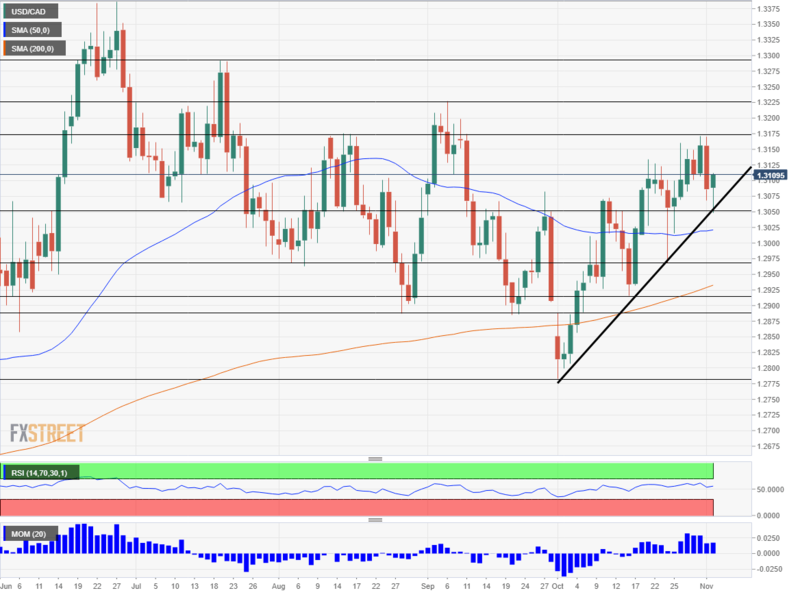 The USD/CAD is trading alongside an uptrend support line that began in early October at around 1.2775 and was confirmed recently. It will be interesting to see if the pair continues riding the line. The USD/CAD trades above the 50-day and 200-day Simple Moving Averages. In addition, Momentum is positive. 1.3175 capped the pair in late October and also back in August. Further up, 1.3225 was a peak in late August. 1.3295 is the next level to watch after it worked as resistance back in July. The peak of 1.3380 towers above. 1.3050 supported the USD/CAD in early November and also held the pair down in late October. Just below the round number of 1.3000, we find 1.2970 that was a swing low in October and provided support in both September and August. Lower, 1.2920 was a low point in mid-October. 1.2880 is a critical level after working as a double bottom. 1.2775 is the last line to watch. 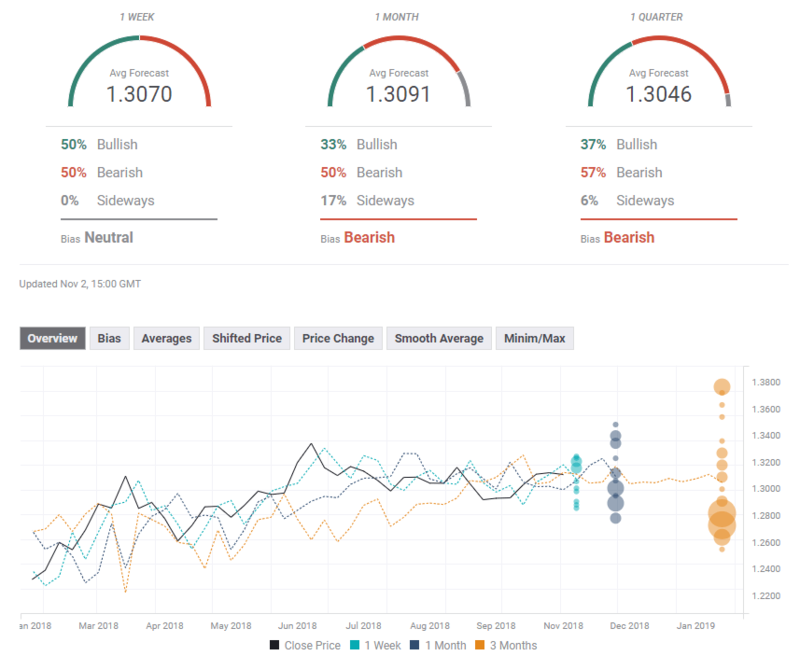 The FXStreet forex poll of experts a neutral bias in the short terms but the trend trends bearish afterward. The figures have not changed much since last week.